The judges called the book “a funny, efficiently-rendered picaresque tale” that “superbly traces the hero’s psychic collapse.” Mabanckou, who was born in what is now the Republic of Congo and is now a professor of literature at UCLA, writes about the “the perils of tyrannical government” in a setting that “is vivid and engrossing. 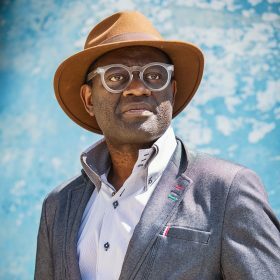 Mabanckou’s writing was celebrated during a gala Friday in Northwest Washington, where a ballroom filled with literary stars — including powerhouse publishers, poets, editors, screenwriters and playwrights — celebrated “black excellence” in storytelling in the African diaspora. “Black writers continue to push through the barriers that have limited our ability to speak our truth to the world,” said Melanie Hatter, chairman of the board of the Hurston/Wright Foundation, which is named in honor of Harlem Renaissance writers Zora Neale Hurston and Richard Wright, and was founded more than 25 years ago with a mission to encourage writers of African descent and to ensure the survival of literature by black writers.